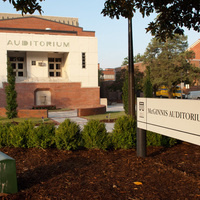 The McGinnis Theater is home to productions of ECU’s School of Theater and Dance as well as courses in theater design and production. I have seen the 1972 movie of this musical, "1776", and compared to that production, I have to say that the cast of the ECU production did a great job. I especially liked the actors who portrayed John Adams, Abigail Adams, John Dickinson, and Colonel Thomas McKean, though they all were quite good.